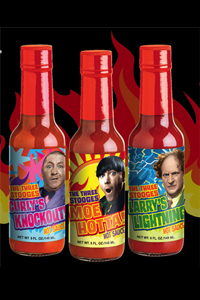 The Three Stooges® Hot Sauce Collection, featuring Curly's Knockout Hot Sauce, Moe Hotta Hot Sauce and Larry's Lightning Hot Sauce, will be an instant collector hot sauce set. Not only do these flavorful hot sauce bring back great memories, they are POIFECT to give as gift to ALL KNUCKLEHEADS!! So, don't be a WISEGUY and order All Three Hot Sauces today.....and save! MAGNETS ARE NO LONGER AVAILABLE. I love them! Great product. Great price. Great service. sent the "3 Stooges" three bottle kit to one of my best friends for his 50th birthday and he was just blown away! We had a very good laugh over this unique item! Thanks to the creator and MoHottMoBetta! Prost!